Marking the 100th performance of Chicago Shakespeare Theater’s Othello: The Remix (written, directed and with music by The Q Brothers), cast members performed the hip-hop adaptation of Shakespeare’s tragedy for inmates on Monday, May 20, 2013 at Cook County Department of Corrections. After the performance, actors answered questions from the audience in a discussion led by The Q Brothers and Superintendent Edward J. Byrne. The performance was made possible through a partnership between The Q Brothers, Chicago Shakespeare Theater and Still Point Theatre Collective. 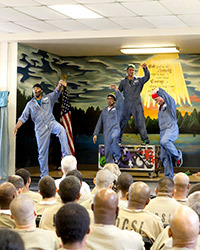 Pictured: The cast of Othello: The Remix performs at Cook County Department of Corrections. Help us meet our fundraising goals - a tax-deductible gift before the end of our season on June 30 will support the work on our stages, in the schools and communities, and across the globe!